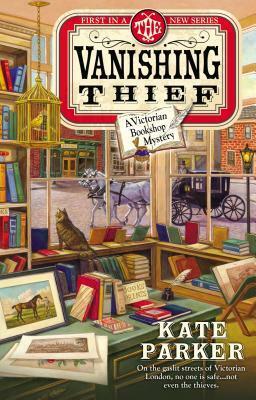 Today I'm featuring the opening paragraphs and a teaser from The Vanishing Thief by Kate Parker, the first novel in the Victorian Bookshop cozy mystery series. I love stories set in book stores, and I also like books set in England during the Victorian and Edwardian eras. Early spring rain drenched London in a cold damp that either kept customers away or drove them into the bookshop. Today the rain was in our favor. We had three browsers searching the shelves when a woman barreled in, flinging droplets in the musty air and onto the wooden floor. "The Duke of Blackford kidnapped Nicholas Drake and you must save him." My assistant, Emma, looked up from the recent arrivals she was discussing with a female customer and said, "Is that a new novel?" The woman planted thin fists on her hips, shoving back her cloak and displaying a green dress faded to the shade of mushy peas. "No. I'm demanding the Archivist Society do something to free Nicholas Drake from the Duke of Blackford." All three customers stared at her, mouths agape. The Archivist Society unfortunately appeared in the penny press occasionally, earning us a notoriety we didn't desire. First Chapter ~ First Paragraph #74 and Teaser Tuesdays was originally published by Catherine for bookclublibrarian.com. This post cannot be republished without attribution.